Reports out of Orlando describe a dangerous shootout last night as an armed intruder attempted to enter the Studz gay bar on Mills Avenue at closing time when an employee was taking out the trash. The bartender at Studz pulled out a gun and exchanged gunfire with the intruder, who then fled. 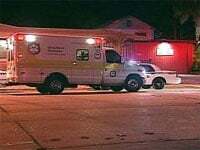 The bartender was shot in the melee and taken to Orlando Regional Medical Center where he was treated for his injuries. Last June, two gay men were attacked and robbed while leaving that city’s Parliament House nightclub.